The exchange rate can have a significant impact on the investment return of a foreign investment over shorter time horizons. The strengthening of the rand since 2016 has had a material currency effect on the valuation of rand-denominated feeder funds. We believe investors need to take a longer-term view and look past the shorter-term movements of the currency. Investors’ personal circumstances, risk profile and longer-term financial planning objectives are all important factors to consider when investing offshore. Given the diversification benefits, reduced emerging market and currency risk, and maintenance of ‘hard’ currency spending power, investors are regularly reminded of the wisdom of investing offshore and not adopting an investment strategy that focuses only on South African assets. However, a long-term view is required to fully benefit from offshore assets’ return potential. While the case for investing offshore is compelling, it is important to consider where the return from an international investment could come from: the exchange rate and/or the underlying foreign investment. The impact of exchange rate risk on a foreign investment is therefore a key element to take into account. In fact, studies have shown that when considering the historical returns of foreign investments, the impact of the exchange rate is uncertain and volatile, and that when measured over shorter time horizons, the exchange rate can have a significant impact on the investment return in rands. Research indicates that it is only over longer time horizons that the underlying investment contributes more to the return than the exchange rate. This shorter-term impact of the currency is clearly illustrated in Figure 1 on the following page. 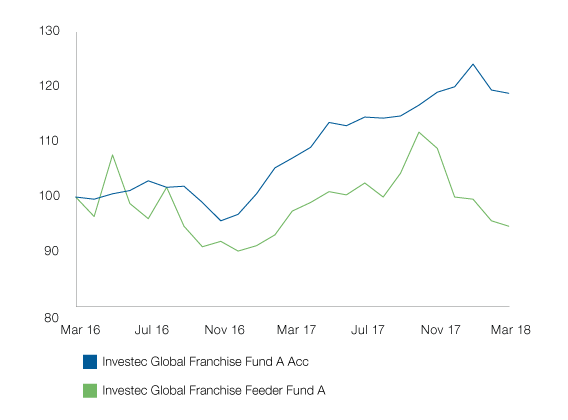 The first chart shows the performance of the Investec Global Franchise Fund in dollars and the performance of the Investec Global Franchise Feeder Fund in rands for the two years to 31 March 2016. The second chart reflects the same but for the two years to 31 March 2018. What can we learn from the charts in Figure 1? The two-year dollar returns of the Investec Global Franchise Fund were both positive at an annualised 6.6% p.a. (31 March 2016) and 9.1% p.a. (31 March 2018). However, the two-year rand returns of the Investec Global Franchise Feeder Fund are significantly different at an impressive 25.5% (31 March 2016) and then a disappointing -2.7% p.a. (31 March 2018)! Clearly, the depreciation and subsequent appreciation of the rand has had a significant impact on investor returns – in the first period providing a strong tailwind to performance and in the second a strong headwind! *Past performance should not be taken as a guide to the future, losses may be made. Data is not audited. Source Morningstar Direct, dates to 31.03.16 and 31.03.18, NAV based, inclusive of all annual management fees but excluding any initial charges, gross income reinvested, in US dollar (Investec Global Franchise Fund) and ZAR (Investec Global Franchise Feeder Fund). Highest and Lowest refers to the highest and lowest 12-month rolling returns since inception. Highest: 54.4%, Lowest: -38.7% – Investec Global Franchise A Acc share class (**launch simulation date: 10.04.07). 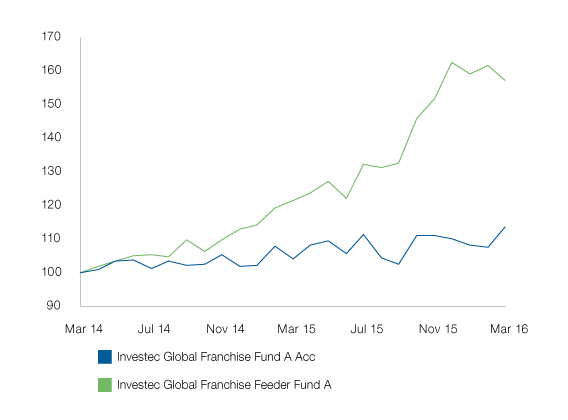 Highest: 45%, Lowest: -40% – Investec Global Franchise Feeder A class (inception: 21.05.96). The total expense ratio and transaction cost for the Investec Global Franchise Feeder A is 2.09% and 0.0%, respectively. All things being equal, economic theory states that investors can expect a domestic currency to depreciate in line with the differential between that country’s inflation rate and those of its major trading partners. With inflation within the South African Reserve Bank's 3-6% target, South Africa’s inflation rate exceeds the inflation rates of its major trading partners. Therefore, over time, we can expect the rand to depreciate against these currencies. Figure 2 illustrates the overall deteriorating performance of the rand against the US dollar since 1972. The chart uses the theory of purchasing power parity (PPP) to illustrate the relative cheapness or expensiveness of the rand against the dollar over time. (PPP is a theory which states that exchange rates between currencies are in equilibrium when their purchasing power is the same in each of the two countries.) When the green line in Figure 2 is above the pink line it suggests that the rand is cheap and vice versa. The two blue lines represent two standard deviations (2SD) – cheap or expensive. This simply means that we expect the rand to trade within these bands about 95% of the time. Currently, PPP is suggesting that the rand is close to fair value and therefore, over the longer term, we can expect the rand to continue to depreciate. It is worth noting, however, that the rand has very seldom traded at fair value, and has also traded at expensive and cheap levels for extended periods of time. Source: I-Net Bridge, Bloomberg and Investec Asset Management as at 30.04.18 – log scale. How best should investors go about investing offshore? Investing in an FSCA-approved collective investment scheme (unit trust fund) that includes offshore assets (e.g. 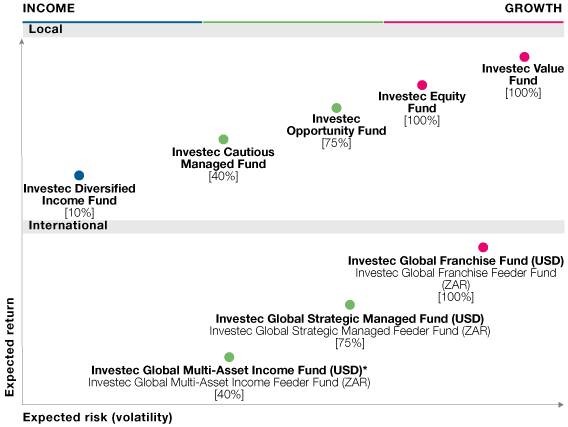 the Investec Diversified Income, Cautious Managed, Opportunity, Equity and Value Funds). For example, a Regulation 28-compliant multi-asset or balanced fund is allowed to invest up to 30% in international assets. By making use of this type of fund, investors are effectively appointing a professional money manager who has the time, experience and access to information to decide when and how much to invest offshore, and into which assets. As a subset of this option, a worldwide flexible fund, such as the Investec Worldwide Flexible Fund, is potentially a more efficient investment solution. It is not constrained by geographical or asset class limits; that is, the portfolio managers can invest up to 100% in domestic or offshore assets across any asset class, depending on where they see value. Investing in an FSCA-approved rand-denominated international unit trust fund (e.g. the Investec Global Multi-Asset Income Feeder, Global Strategic Managed Feeder and Global Franchise Feeder Funds). By doing so, investors do not make use of their individual offshore allowance. Rather, they invest in rands and when they disinvest, the proceeds are paid in rands. While investors benefit from being invested in funds that only hold offshore assets, they remain exposed to South Africa-specific risk. Investing in a foreign-domiciled international unit trust fund that is registered in South Africa (e.g. the Investec Global Multi-Asset Income, Global Strategic Managed and Global Franchise Funds). By doing so, investors invest directly in an FSCA-approved offshore fund in its dealing currency e.g. dollars, pounds or euros. When disinvesting, investors will then also receive the proceeds in the fund’s dealing currency. We believe that when investing in international assets, investors need to take a longer-term view and look past the shorter-term movements of the currency. However, this is often more difficult said than done, and highlights the benefits of appointing a good financial coach who can assist investors in staying the course. Note: [ ] indicates maximum in equities. *As an internal limit, the Fund will normally invest no more than 40% of its value in the shares of companies. The Investec Global Multi-Asset Income, Investec Global Strategic Managed and Investec Global Franchise Funds are available as ZAR feeders. The Investec Global Strategic Managed and Investec Global Franchise Funds are available in hedged GBP classes. 1 See Investec Asset Management Viewpoint ‘How to invest offshore’, April 2017.